Element G Gaming headset G531 – Verico International Co., Ltd. Element G's Gaming Headset G351's unique design packed with Virtual Surround Sound 7.1, powerful 40mm audio driver for an immersive in-game situational awareness through true to life positional audio system. 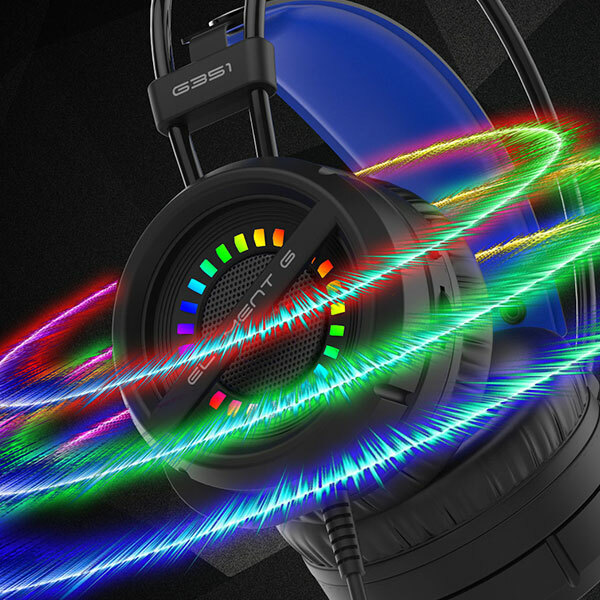 Highlighted with fine-tuned bass, Element G Gaming Headset G351 offers a thundering 3D deep bass effect for a pleasant and excitement gaming experience. Engineered with a stunning RGB Lightning effect for a more realistic and true-in-game environment. RGB LED for an amazing light effect. Stylish and Modern RGB lighting design and cool lighting effects to emphasize your adventurous style. High-quality PU & Big ear cups cushion design helps to provide the right fit for a Game all-night long with plus comfort and optimized weight for extended wear. Whether it is stream or game communication, G351 offers the perfect support for a crystal clear communication with your teammates. 40mm large headphone driver with breathable leather cushions earmuffs.